One vital but often overlooked component of a modern high performance Mopar engine is the 5.7 Hemi reluctor ring. These are also known as a hemi reluctor wheel and some people call them a hemi tone ring. It does not matter what you call it, but without the right one installed your engine will not run correctly, if at all. Molnar Technologies makes high quality replacement hemi reluctor wheels for use with all Molnar Gen 3 Hemi crankshafts. These reluctors all use a 4 bolt attachment pattern. The tooth count and model year reluctor ring you choose must be matched to the model year and tooth count that the computer in your vehicle is made to work with. For example, a 2005 Dodge Charger using the stock computer and a Molnar crankshaft would need a 32 tooth 5.7 Hemi reluctor wheel. This 5.7 hemi reluctor ring is the correct one to use with Molnar Technologies Gen 3 Hemi cranks in engines requiring a 32 tooth hemi reluctor wheel. It uses a 4 bolt attachment which is the same as the OEM Chrysler 6.1 crankshaft. The 2003 – 2008 5.7 and 6.1 used the 32 tooth wheel. If you have a 2009 – 2012 Gen3 Hemi with a 58 tooth reluctor wheel and Molnar crankshaft this is the correct Hemi tone ring for you. (NOTE: Some people count the teeth on the 2009 and later as 60, but difference is only in how people count the large teeth, so even though some people say 58 and some 60, they are both the same reluctor). Chrysler / Dodge changed the OEM reluctor and engine management system in 2013. 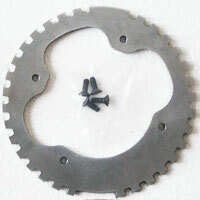 If you are working with a 2013 or newer vehicle and Molnar crank then this is the proper 58 tooth reluctor ring to use.